KLS is proud to announce we have completed our first Class I Contaminated Site Project. We responded to our client’s urgent request to contain and remediate a local commercial property that had soil impacted with Cr+6 (Hexavalent Chromium). KLS performed all excavation activities as well as mobilized and transported the material to a Class I landfill nearly 4 hours away. 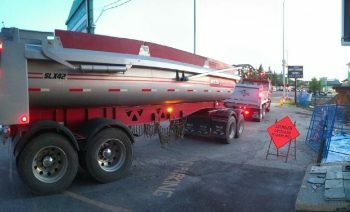 As this site was in a busy urban area, the loading took place at 3am to avoid vehicle and pedestrian traffic. Further to this, the soil contamination did not pose an airborne threat but the PPE at the site was elevated to ensure the safety of our excavation team, wearing full Tyvek suits and 1/2 mask face protection with 3M P100 filtration cartridges. Thank you to the entire KLS team that participated and safely executed this complex and unique project. Each of you truly demonstrated the quality and safety that these projects require.